Projects can contain many tasks and up to ten hierarchical levels. Every employee who is assigned to a project can create a task for that particular project. Administrator can customize task add permission using[Role Permission]option available in admin options. Task is the main source of project time sheet. Time entry can only be entered for a task of any project. [Administrator]should create projects and define project manager and team lead of projects. [Administrator]or[Project Manager]or[Team Lead]can then define “Project Team”. [Project Manager]and[Team Lead]then can create project tasks and assign them to project team in order to allow employees to enter time entry for that task. Only user who is part of project team can add new task in a project. A task can be created using[All Employee Task]checked. All employee tasks appear in time entry of all team members of project. A task can be created using[All Project Task]checked. All project task appear in time entry of all projects. A task can be created using both[All Employee Task]and[All Project Task]checked. Those task then will be appeared for all projects and in all employees time entry. Project manager can categorize their project tasks in different milestones (phases) for easier monitoring of individual milestones (phases) and then at project at root level. Task Type (category of task. It depends upon usage to usage of OfficeTimer in different environments. Administrator can create new task types as per their organization needs from Admin options –> task types). 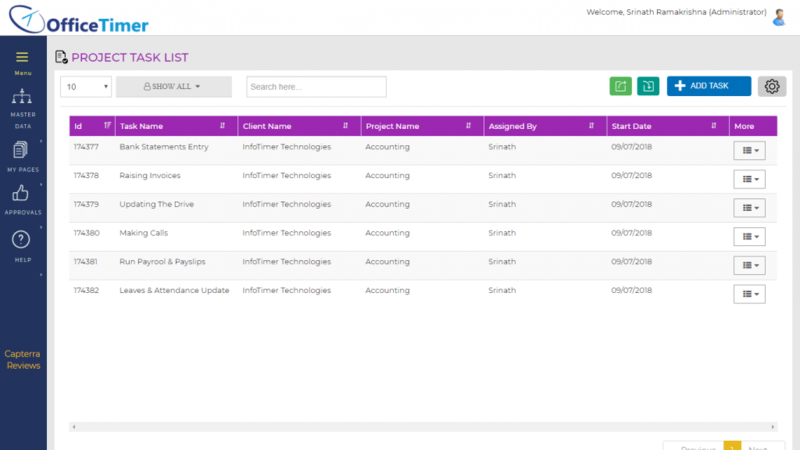 All Project Task (Check this field, if you want this task to be appeared in time entry of all projects. General routine tasks for which you don’t want to add in all project). Select employees which you want to be assigned in this task. Employee assigned in task will only enter time entry of a task. Assign to is not require if a task is defined as[All Employee Task]. Tasks can be viewed these four different options. Project –> Tasks(Hierarchical view of all task for administration purpose). An administrator can add, edit and delete any task from there. Fill all task information in[Task information Form]. Click on add to add this task. Task will be then appear in [My task] of employee who is assigned to any task. 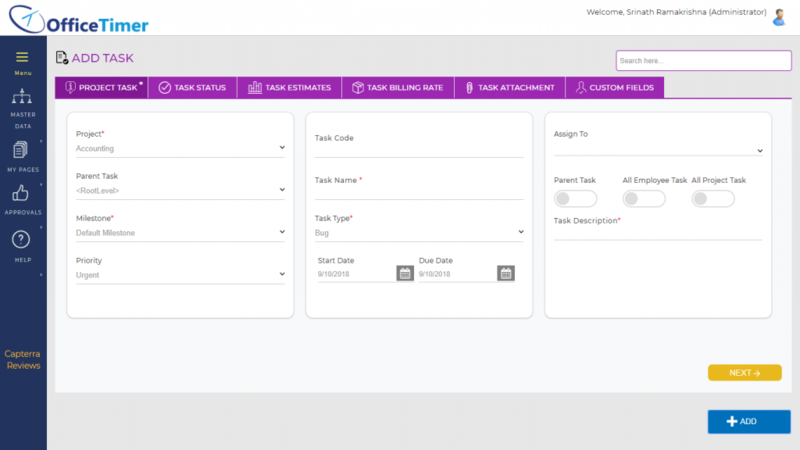 A logged-in employee can modify any task by clicking on any task in[My task]task list. An employee can update task title, task comments, task status, completed, completed % in task modification form. Task Comments are the history of comments from different task related users in order to communicate different issues/ updates/comments for that particular task between a team. Task comments cannot be deleted once it entered. 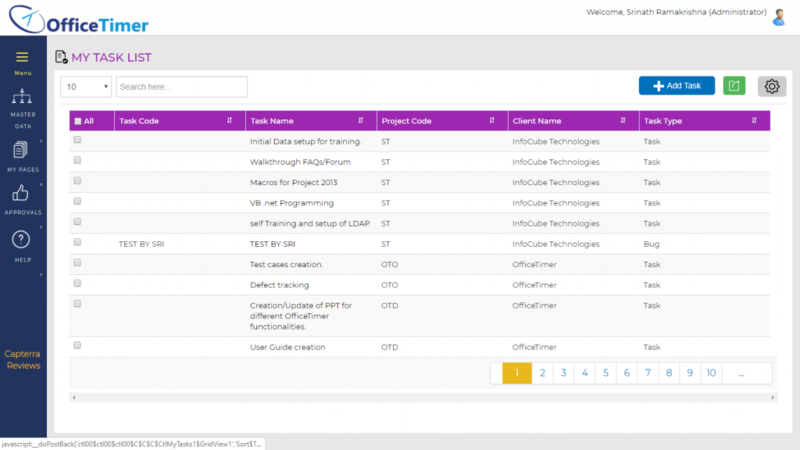 Open task by clicking on task either from[My Task],[My Area]or[Project–Tasks]. Click on[Add]to add that task comments. Click on browse button to locate your file on your local system. And click on open after selecting your desired file in file selection dialog box.